The grill, griddle and pan all in one. 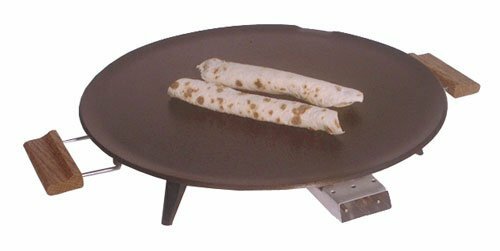 The sleek design of the Heritage non-stick grill is ideal for making lefse, pancakes, hamburgers, tortillas, ethnic breads and much more. The electric aluminum grill has a temperature probe that has a range from warming , 200 degrees to 500 degrees, demanded by many lefse bakers and also ideal for grilling meat. Controllable dial temperatures let you grill to perfection meats, eggs, pancakes and all your favorites. Grill is 16\" diameter with unique overflow spout on deep edge rim to control spills and splatter; heat resistant legs with hardwood handles. Recipes included. If you have any questions about this product by Bethany Housewares HeritageGrill SilverS, contact us by completing and submitting the form below. If you are looking for a specif part number, please include it with your message.